Click to read: Triumph Thruxton owners reviews, Triumph Thruxton specs and to see the Triumph Thruxton image gallery. I LUSTED AFTER a Thruxton when I first glimpsed one at the NEC a few years back, picturing myself in cut-off denims and an open-face lid cruising off into the sunset... However, riding one didn't seem to deliver the dream. I imagined the engine would have a rough, burbling feel, but instead it was as silky smooth as any 21st century Honda. Triumph's 'golden oldie' has a sensible seat height for those short in the leg or lacking in confidence and, although there's no wind protection, you can get neatly tucked in with the café racer riding position. The wheelbase feels quite long so you have be patient while making three point turns and tight manoeuvres through traffic, but high speed handling and stability is spot-on. The single disc brake isn't the most powerful I've tested so both front and rear stoppers need to be yanked on when slowing from higher speeds. 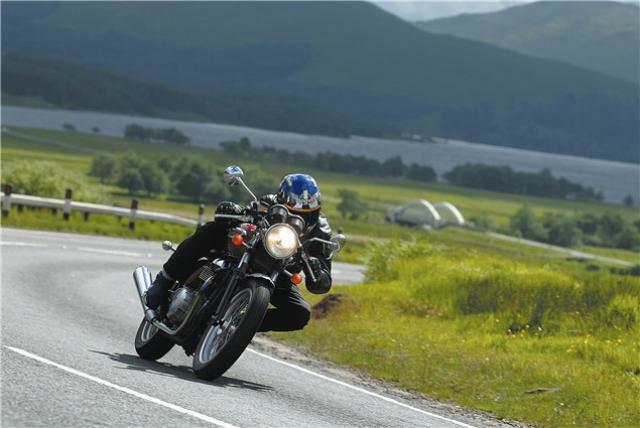 Talking of speed, the Thruxton has pretty lethargic acceleration and is happiest cruising along at 80mph; to reach the claimed 120mph top whack requires a steep hill and a tail wind. All said and done, this retro is well finished, very reliable, nearly fun to ride and, most importantly, providing it's in black, looks beautiful.